Serenity is becoming alarmingly absent from our daily existence, especially within the urban context. Time is dense and space is tumultuous. The idea of the serene has gained currency in postmodern discussions, and when combined with urbanism conjures questions, even contradictions, as the two ideas seem improbable yet their correspondence seems so inherently desirable. Integrated, these two constructs present design challenges as they manifest in differing ways across the rural–urban transect. 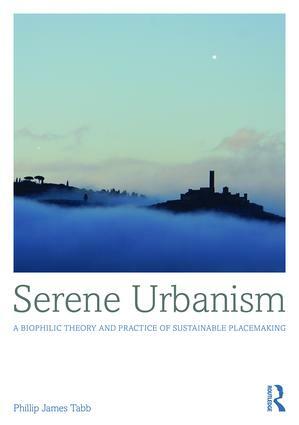 In response, Part I of this book establishes the theoretical framework through different contemporary perspectives, and concludes with a clear explanation of a theory of serene urbanism. The positive characteristics of urbanism and beneficial qualities of the serene are explored and related to sustainability, biophilia, placemaking and environmental design. Both principles and examples are presented as compelling portraits for the proposal of these new urban landscapes. Part II of the work is an in-depth exploration and analysis of serene urban ideas related to the intentional community being created outside of Atlanta, Georgia, USA. "Serenbe" is the name given to this place to commemorate the value and nuance between the serene and urban. Phillip Tabb illustrates the practical power of good theory. He demonstrates that an understanding of nature can enable architects and planners to create authentic, deeply rooted places. His work in planning the new community Serenbe near Atlanta provides strong, positive evidence for Professor Tabb’s biophilic approach. This thoughtful, timely book bridges theory and practice and should interest those with a desire to better understand sustainable urban design and planning. Phillip James Tabb is Professor of Architecture and Liz and Nelson Mitchell Professor of Residential Design at Texas A&M University. He completed a PhD dissertation, “The Solar Village Archetype: A Study of English Village Form Applicable to Energy-integrated Planning Principles for Satellite Settlements in Temperate Climates” in 1990. Among his publications are Solar Energy Planning (McGraw-Hill, 1984), The Greening of Architecture: A Critical History and Survey of Contemporary Sustainable Architecture and Urban Design (Ashgate, 2014), and Architecture, Culture, and Spirituality (co-edited with Thomas Barrie and Julio Bermudez, Ashgate, 2015). He received his BS in Architecture from the University of Cincinnati, Master of Architecture from the University of Colorado, and PhD in the Energy and Environment Programme from the Architectural Association in London. He teaches studio design, sustainable architecture, and the theory of placemaking, and is a practicing urban designer and licensed architect.